Wireless mice are commonplace these days but many only work with their own brand wireless transceiver, which restricts their use to devices equipped with USB ports. Less common are Bluetooth-based mice which have the potential to work with any Bluetooth-equipped unit, including Android and iOS tablets, potentially making them much more useful. 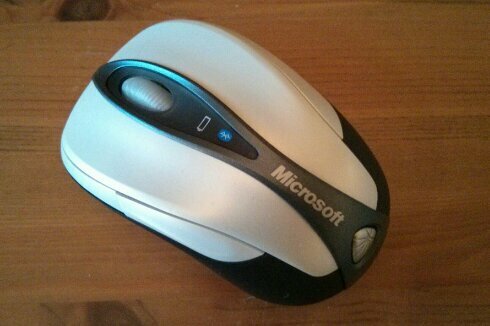 On review here is one such mouse, the Microsoft Bluetooth Notebook Mouse 5000. Snappy name, but let’s take a look. The 5000 is fairly typical of notebook mice being smaller than a typical desktop mouse at only 9 cm long and about 5.5 cm wide. People with large hands may find the mouse is too small but for occasional use with a tablet or notebook, it’s fine. I certainly wouldn’t want it as my main mouse as I can’t really rest my hand on it, but this is all subjective and some people may find it perfect. Looks-wise, it’s not a Microsoft Arc or a Logitech Ultrathin, but it’s not entirely unattractive. This is the version with silvery-white buttons and dark gray body; there is a version with these colours reversed too. The silver matched my Samsung Chromebook rather nicely but the colour does vary with the light. Two Duracell AA batteries power the 5000, which are supplied in the packaging and Duracell’s make a welcome change from the generic AAs that usually accompany remote controls and other battery-powered accessories. There’s an on/off switch on the bottom to conserve power when not in use. I’ve been using the mouse for about a week and I’ve yet to replace the batteries. To pair the mouse, there’s a second button on the underside that needs to be pressed for a few seconds to put the mouse into a pairing mode. After that, the mouse should appear in the device list of whatever computer is to connect to the mouse. I successfully paired with an Android tablet, a Windows 8 tablet and a Chromebook. I imagine that it will work with iPads and other iOS devices but I didn’t have one at hand to test. In use, the 5000 works pretty much like any mouse. It’s an optical mouse with a laser motion tracker so resistance will depend entirely on the surface in use. There are four buttons: left, right, middle and “back”, which is next to the main left button and can pressed by your thumb to take your web browser back a page – you can see it in the top picture. Great if you are right-handed, but a waste of time if you are left-handed. The scroll wheel has a bit of stiffness to it but I like that as it prevents accidental scrolling. 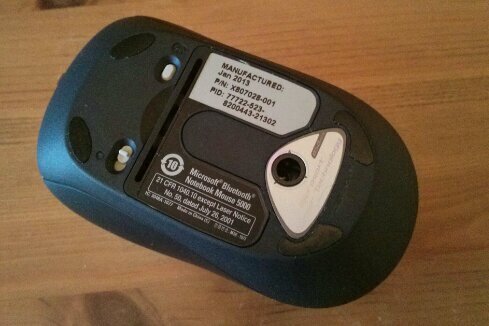 Overall, the Microsoft Bluetooth Notebook Mouse 5000 is a good mouse but not a great mouse. It’s nothing special but there’s nothing wrong with it either (except for the back button only being useful to right-handed users) . The 5000 is available from all good retailers for around £25. Disclaimer: this was a personal purchase.